Appearance… A driveway is like a large welcome mat for your home. It’s the first thing people see when they visit. 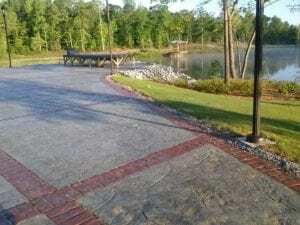 The beauty of concrete can’t be paralleled, especially with some of decorative aspects such as staining and stamping. Long Term Value… Although the initial cost of concrete is more than asphalt, concrete will last as much as three times as long as asphalt. This makes concrete cheaper in the long run with less maintenance, resurfacing, and replacement costs. Safety… The non-skid surface on concrete makes it safer to walk on, especially when it’ wet and in the winter when ice forms. Concrete is also more visible at night. Maintenance… Concrete requires a lot less maintenance than asphalt. You don’t have to mess with those nasty asphalt coatings. Cleanliness… Concrete is much cleaner. You won’t track those oily asphalt sealers into the house. Comfort… A concrete driveway is more comfortable and cleaner to walk on with bare feet. This is especially true in the summer. Concrete won’t heat up in the sun like asphalt.